After the first serving, wet food is not always fresh for your cat – and some cats find refrigerated leftovers less appetizing. Plus, leftover wet food can be a messy hassle for you. That’s why we created a single serve meal for cats. 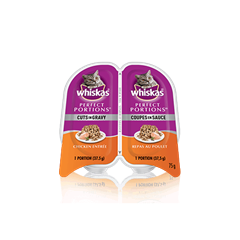 With the single serve pack format, it’s a fresh meal for your cat every time with no messy serving and no leftovers*. The perfect meal for your perfect companion. It has an appealing paté texture and is available in real flavours like Chicken, Turkey, Beef, Salmon, Whitefish & Tuna, Seafood, Chicken & Liver, and Chicken & Tuna. 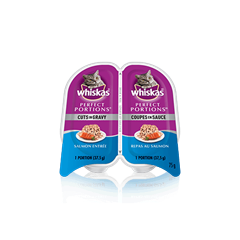 WHISKAS® PERFECT PORTIONS™ is a revolution in wet cat food. Available in 2 x 37.5g packs (two servings per pack). CHICKEN BROTH, WHITEFISH, CHICKEN, TUNA, CHICKEN LIVER, POULTRY BY-PRODUCTS, MEAT BY-PRODUCTS, COLOUR, VITAMINS AND MINERALS, GUAR GUM, SODIUM TRIPOLYPHOSPHATE, FISH OIL (PRESERVED WITH MIXED TOCOPHEROLS), DL-METHIONINE, SALT, TAURINE. 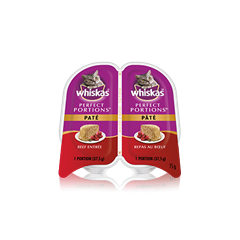 WHISKAS® PERFECT PORTIONS™ Paté Seafood Entrée is formulated to meet the nutritional levels established by the AAFCO Cat Food Nutrient Profiles for all life stages. 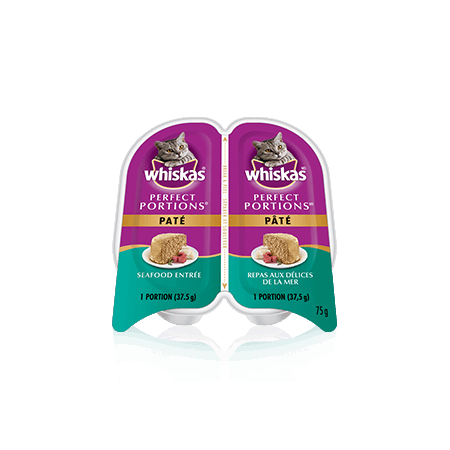 Feed adult cats 3 portions per 5 pounds of body weight twice daily. Feed pregnant and nursing cats 2 to 3 times their normal amount. Feed a kitten up to 5 portions twice daily.